Just 2 days until Christmas Eve! I have the last few things to do to finish getting ready! I am hosting Christmas Eve this year and have invited not only family, but friends as well, especially those who are attending (working) both Christmas Eve services at church! They need to eat, right? So I've been scouring the 'net to get ideas and make my lists. My Friday Loves this week has a lot to do with food, but I have a few other goodies to share. 1. I read about this Cast Iron Skillet Cranberry Crumble on one of my favorite blogs, On Sutton Place, and new I wanted to try it for our party. 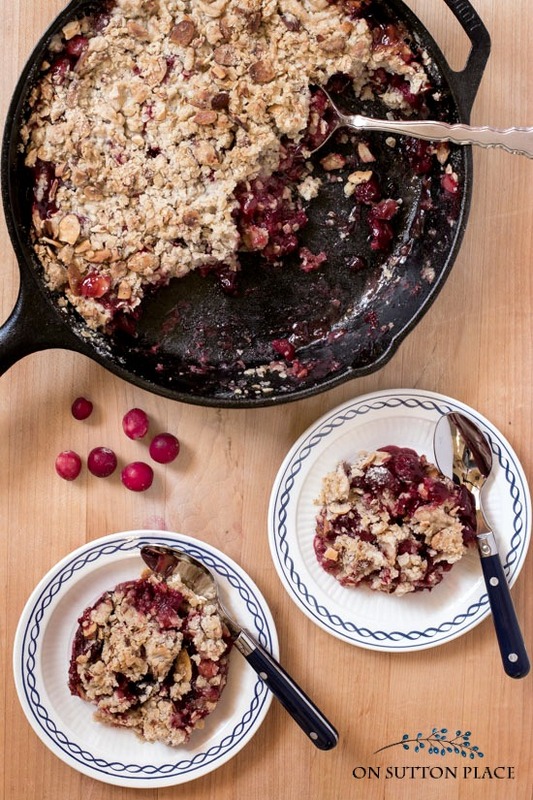 I love crumbles and I love cranberries, and doesn't the red makes it look so festive!? 2. 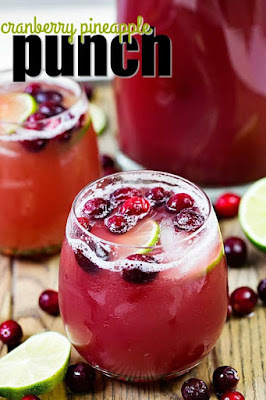 Besides beer and wine, we wanted to feature a pitcher cocktail and have it be both for adults and for not adults so of course I went to Pinterest for inspiration. Since I am already making the cranberry dessert I looked for a cranberry drink and found this cranberry pineapple punch which sounds easy and delish! 4. Last year I saw this pine cone garland and knew I wanted to make it! I never got around to it last year but as the weather started to cool off I remembered it. When we went camping last month, I collected a blue Ikea bag full of pine cones. I did not get the wire she recommended and I regret that decision. The one I used was much harder to work with! I ran out of wire and I still haven't been back to the craft store to buy more. You can see from my picture that I need a few more on the left side. One change I made was to make three swags: the longer middle one and the two sides. It was getting really heavy! Her garland was not as full so probably not as heavy but I like the fullness of mine. I think it looks Christmasy but I think it would work into the new year. What do you think? Can leave it up for longer? 5. Every year, right around this time, I start looking to the new year that is right around the corner. My husband and I like to reflect on the year that has passed and make plans for the coming year. We like to categorize these goals or resolutions into four areas: Physical, Spiritual, Mental, and Personal. I was recently listening to The Simple Show podcast and she mentioned the 20 Questions for the New Year that she shares on the Simple Show's website. You might be interested in reading through them and see what things bubble up. 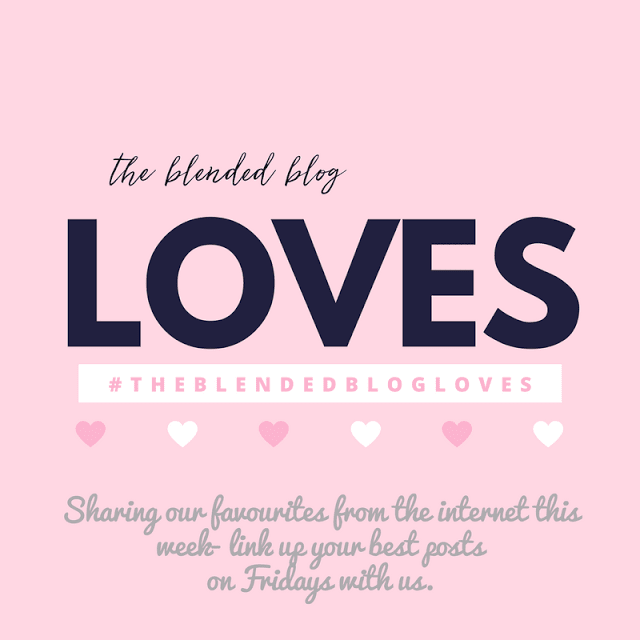 The Blended Blog will be sharing more resolution-related stuff in January so be thinking about what kinds of changes you'd like to make in the new year and then link up with us. We'd love to hear!